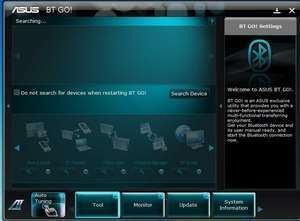 ASUS Bluetooth Suite is a powerful application that was especially designed to provide you with a means of transferring files using the Bluetooth connection and the dedicated device. The program can manage the connected Mini Bluetooth Dongle and allow you to activate the wireless transfers between your PC and any Bluetooth device. ASUS Bluetooth Suite is a powerful application that was especially designed to provide you with a means of transferring files using the Bluetooth connection and the dedicated device. Version 7.2.0.60 is a freeware program which does not have restrictions and it's free so it doesn't cost anything. For security reasons, you should also check out the ASUS Bluetooth Suite download at LO4D.com which includes virus and malware tests. Additional screenshots of this application download may be available, too. The Bluetooth software category includes software reviews and downloads for popular Bluetooth networking applications for use with portable devices such as phones, android, iphone and ipods. Check out some of the freeware downloads available in the bluetooth program category. They contain no strings and are available at zero cost. 3 out of 5 based on 73 ratings.